Lockheed Martin has received a $147.3 million cost-sharing contract from the DARPA to conduct research as part of a prototype agreement for the Tactical Boost Glide program. The Tactical Boost Glide (TBG) program is a joint DARPA/U.S. Air Force (USAF) effort that aims to develop and demonstrate technologies to enable future air-launched, tactical-range hypersonic boost glide systems. In a boost glide system, a rocket accelerates its payload to high speeds. The payload then separates from the rocket and glides unpowered to its destination. TBG is a two-phase effort that plans to include ground and flight testing to mature critical technologies, and aims to demonstrate the system performance achievable through the integration of those technologies. The program is using a disciplined systems engineering approach to define demonstration system objectives and identify enabling technologies needed for future systems. The TBG program is exploiting the technical knowledge and lessons derived from development and flight testing of previous boost glide systems, including the Hypersonic Technology Vehicle 2 (HTV-2). US Air Force Chief Scientist Greg Zacharias said based upon the current trajectory, the US Air Force will likely have some initial hypersonic weapons ready by sometime in the 2020s. In the 2030s, the air force could have a hypersonic drone or ISR (intelligence, surveillance, reconnaissance) vehicle. “I don’t yet know if this is envisioned to be survivable or returnable. It may be one way,” Zacharias explained. A super high-speed drone or ISR platform would better enable air vehicles to rapidly enter and exit enemy territory and send back relevant imagery without being detected by enemy radar or shot down. By the 2040s, however, the Air Force could very well have a hypersonic “strike” ISR platform able to both conduct surveillance and delivery weapons, he added. A key component of this is the fact that weapons traveling at hypersonic speeds would present serious complications for targets hoping to defend against them – they would have only seconds with which to respond or defend against an approaching or incoming attack. 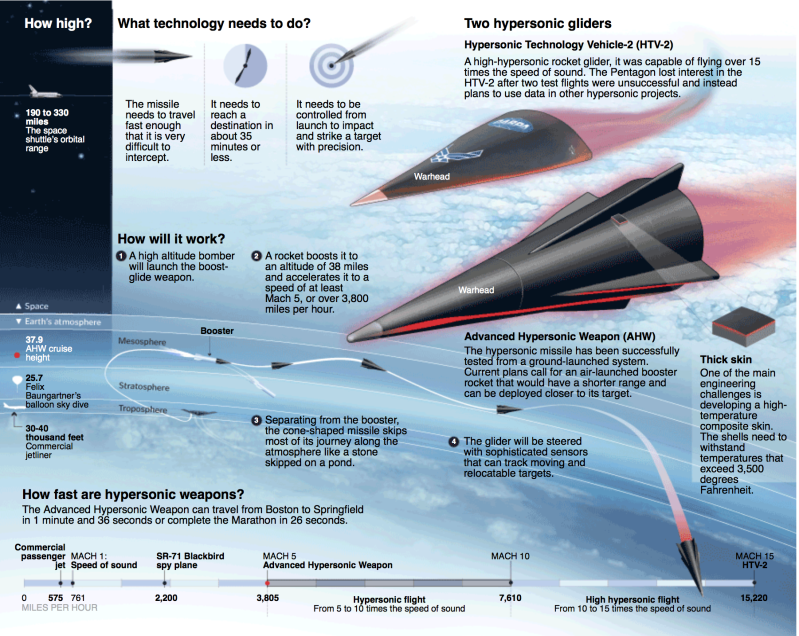 Some hypersonic vehicles could be developed with what Zacharias called “boost glide” technology, meaning they fire up into the sky above the earth’s atmosphere and then utilize the speed of decent to strike targets as a re-entry vehicle. The US currently has no scheduled hypersonic flight tests. The last successful US hypersonic test was in 2013. AFRE aims to explore a turbine-based combined cycle (TBCC) engine concept, which would use a turbine engine for low-speed operations and a dual-mode ramjet—which would work efficiently whether the air flowing through it is subsonic (as in a ramjet) or supersonic (as in a scramjet)—for high-speed operations. The two components of the hybrid engine would share a common forward-facing air intake and rear-facing exhaust nozzle to release thrust. AFRE aims to develop critical technologies and culminate in ground-based testing of a full-scale, integrated technology demonstration system. If that testing is successful, further development of the AFRE technology would require flight testing in a potential follow-on demonstration program. China and Russia both had more successful hypersonic tests early in 2016. 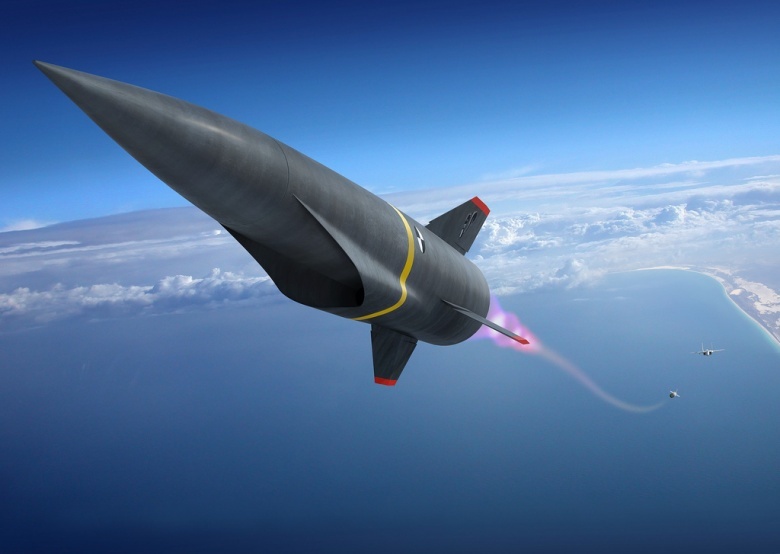 The congressional U.S.-China Economic and Security Review Commission stated in its most recent annual report that the hypersonic glide vehicle program was “progressing rapidly” and that the new strike weapon could be deployed by 2020. A powered version also is in development and could be fielded by 2025. China has had seven successful tests of their Wu-14 / DF-ZF hypersonic glide vehicles. Russian warship Pyotr Veliky – Peter the Great – will be fitted with new-generation hypersonic 3M22 missiles in a 2019-2022 upgrade for the Russian Navy’s only operational nuclear-powered cruiser, the world’s largest nuclear-propelled military vessel that is not an aircraft carrier, a shipbuilding industry source told TASS on Friday. “The Pyotr Veliky will start repairs in the third or fourth quarter of 2019. Repairs and upgrade are due for completion in late 2022, the ship to be equipped with Zircon hypersonic anti-ship missiles,” the source said. “The missile is undergoing development testing and will enter service if it passes,” the source said, without specifying the trial schedule. Zircon’s operating parameters are classified. But according to open sources, the new missile’s range may be up to 400 kilometers (250 miles_, flying five times faster than the speed of sound. Given its sheer speed, the Zircon will be extremely difficult to intercept with current missile defense technology. 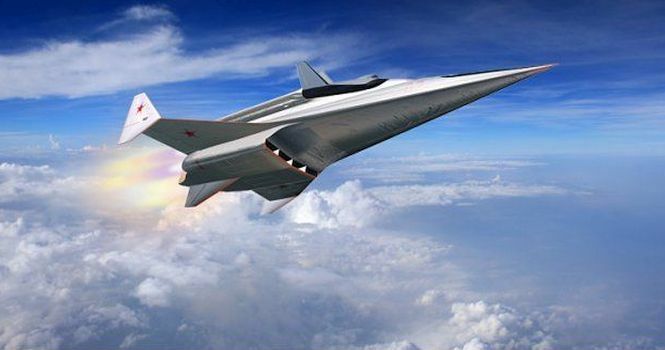 Russia is test-flying a new, hypersonic glide vehicle that follows the contrails of China’s WU-14, a delivery vehicle reportedly capable of carrying nuclear warheads at Mach 10 and less susceptible to U.S. anti-ballistic countermeasures. Moscow has spent several years developing the new Yu-71 and YU-74 hypersonic glide vehicle (HGV), which was first test-flown in February, according to this month’s Jane’s Intelligence Review. It is part of an ongoing escalated effort by the Kremlin to overcome U.S. missile defenses, known as Project 4202. Project 4202 could turn out a limited number of glide vehicles armed with nuclear warheads by 2020, and up to 24 with new hypersonic payloads could be deployed at the Dombarovsky base between 2020 and 2025, the Intelligence Review said. Russia will deploy its new RS-28 Sarmat intercontinental ballistic missiles to units in Siberia and the southern Urals when the enormous new weapon becomes operational in 2018. The massive liquid-fueled missiles will replace the existing Cold War-era R-36M2 Voyevoda (SS-18 Satan) ICBM—which is the largest such weapon ever built. The Sarmat will weigh at least 100-tons and carry a 10-ton payload. That means the missile could carry as many as 15 independently targeted thermo-nuclear warheads. It has a range of at least 6,000 miles. 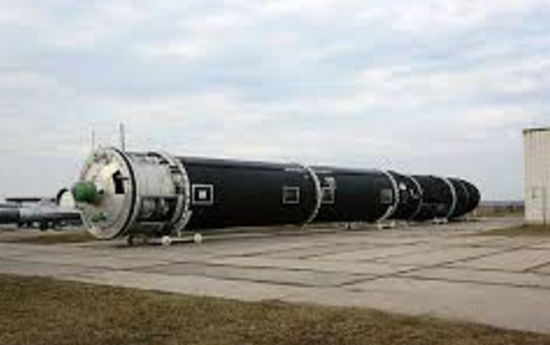 Once it is operational, it will be the largest ICBM ever built. 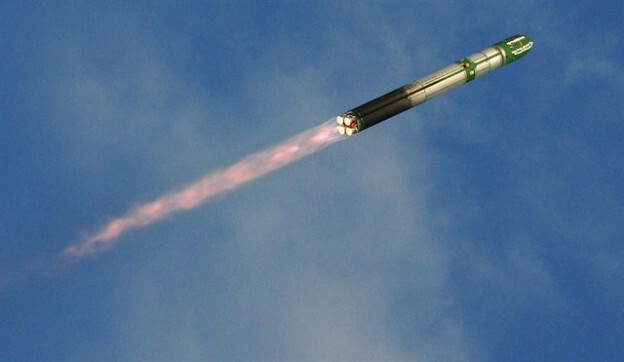 News reports out of the Russian English-language media indicate that the Sarmat will be armed with Yu-74 hypersonic glide vehicles rather than (or perhaps in addition to) conventional ballistic warheads. Sputnik, citing an analytical website called Ostkraft.ru, reports that what they call a Yu-74 vehicle was flight tested from on top of an RS-18A (NATO designation SS-19) ICBM in April. 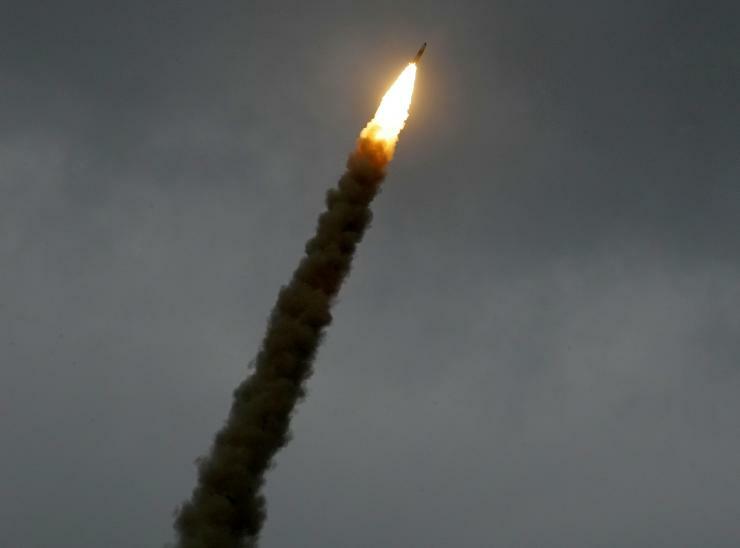 The vehicle was launched from the Dombarovsky missile base and hit its target in the Kura test range in Kamchatka, the details of which remain secret. Designed to carry up to 24 nuclear-loaded Yu-74 gliders, each Sarmat ballistic missile will be able to hit any target located within a six-thousand-mile radius within one hour, Sputnik reports. Each Yu-74 glider can be equipped with a nuclear warhead, electronic warfare (EW) applications, or false target simulators. A prototype of the BrahMos hypersonic missile is expected to be manufactured in 2024 according to the Marketing Director of the Russian-Indian BrahMos Aerospace Company Praveen Pathak. Speed of the existing BrahMos supersonic missile will be increased 4 Mach by 2020. The future hypersonic missile was expected to have the same weight and size as the existing BrahMos missile so that it can be used with the same platforms and launchers. The BrahMos-II is expected to have a range of 290 kilometers (180 mi; 160 nmi) and a speed of Mach 7. India and Russia have agreed ‘in principle’ to export the existing mach 3 anti-ship cruise missile, BrahMos, to third countries – the UAE, Vietnam, South Africa and Chile, Praveen Pathak, spokesman for BrahMos Aerospace.